We offer extraction apparatuses for various applications, including arsine, distillation, cyanide, Kjeldahl determination, Kuderna-Danish concentration, and solvent recovery. Choose from various extraction heaters to address Kjeldahl determination on a macro or micro scale. 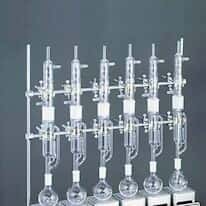 Use soxhlet extraction glassware systems for continuous extraction of solids with a suitable solvent.